Chinese flavours, ingredients and cooking techniques have long been incorporated into the cuisine of Thailand. 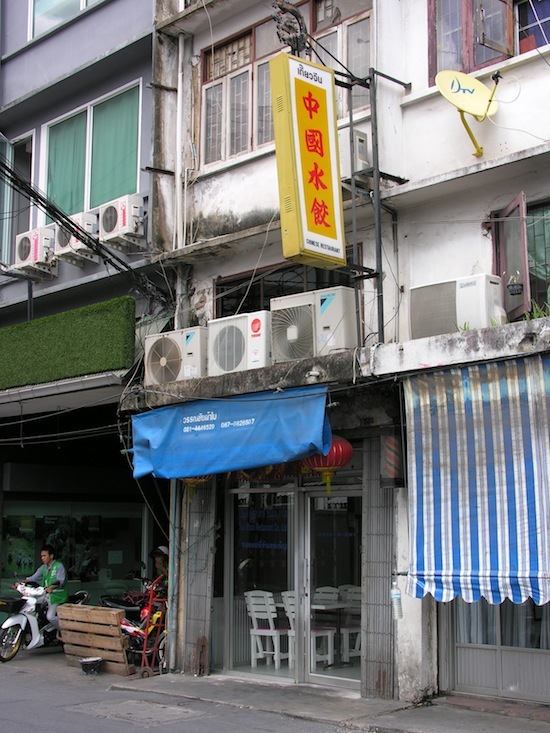 They’re evident on practically every Bangkok street in cheap staples like khao man kai (chicken rice) and noodle soup. 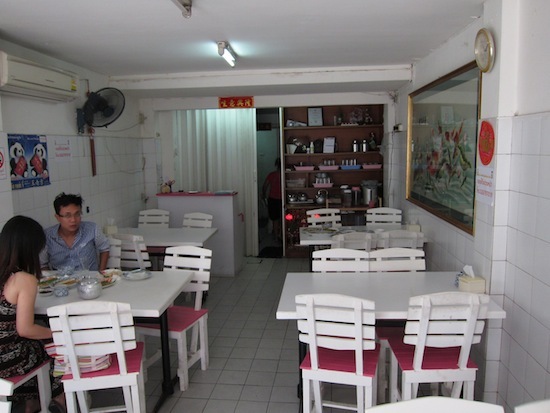 If you’re in the mood for something different, stop by Kiew Jeen for rich northeastern Chinese Liaoning-style food. Liaoning cuisine is known for strong flavours, soft textures, pungent smells and unexpected colours — be prepared for all of these in a trip to Kiew Jeen. 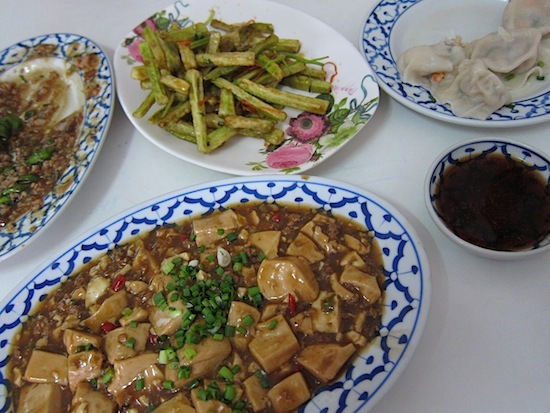 The menu goes heavy on pork, including pig’s feet, kidney, belly and ears, and also includes a few shrimp, fish (the jelly fish looks interesting), beef and chicken dishes, as well as egg and veggie selections like stir-fried bitter melon and cucumber salad. Be as clear as possible if you’re vegetarian; both an eggplant and bean curd dish said nothing of meat on the menu but arrived heavily laden with chopped pork (luckily we were okay with that). Seeing as kiew jeen is a Thai translation of “Chinese wonton“, we jumped right in with a helping of pork and leek wontons. Served with a side of hoisin sauce, the two-bite handmade dumplings were good, though perhaps not as tasty as we’d expect from a restaurant named “wonton”. Next time we’ll try the lightly fried dumplings or steamed stuffed buns. French fried green eggplant — very tasty indeed. 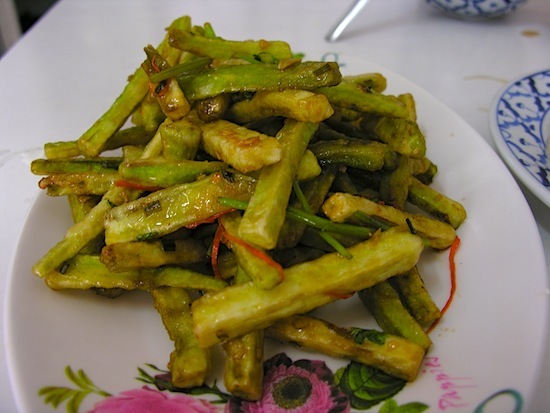 Seeking something that couldn’t be found elsewhere, we then gave the French-fried green eggplant a try. A huge mound of gently fried eggplant strips were crispy on the outside, soft in the middle, and had an addictive tang to go with a hint of sweet and salty. This dish was the star of the meal — and the sort of unusual discovery that you’ll want to share with friends. We went with two main dishes that had very similar presentations — “braised eggplant” and “hot bean curd” were both brown saucy numbers with no shortage of pork. The soft green eggplant came buried under a thick layer of rich sauce, and while not bad, was nothing to write home about. With a savoury saltiness balanced by a spicy heat that materialised gradually on the tongue, the bean curd was quite good. Flavours were indeed very bold; steamed rice and iced jasmine tea did well to offset them. The food is heavy and filling, and dishes came in massive portions — we ordered double what was probably needed to fill up two adults. With most selections going for between 80 and 150 baht, this is a great choice for groups or families on a budget. Decorated with little more than a quiet Chinese floral print on white walls and six white wooden tables, ambiance is pleasantly simple. Cleanliness seems well looked after by an impersonal but efficient staff. In a touristy neighbourhood — but not shooting for tourists. Kiew Jeen is located on Soi Ngam Dupli in the Sathorn part of town, near the corner of Rama IV Road and less than a five-minute walk from Lumpini MRT station. The tiny shop is easy to miss; look for two red lanterns and a raised yellow sign with Chinese characters.